If you remember the video game “Undertale”, then you check out the UnderTale Friends Skin Mod. If you do not remember, then it will be interesting for you to just try it. Here you will tame new mobs and make them your friends. And now there will be several new bosses in the MCPE, which you will have to kill with your new friends. Well, now we will tell you how UnderTale Friends works. Characters have replaced villagers, so they will spawn in the villages. To get a new friend on Minecraft Pocket Edition 1.0, you need to give him your heart – it’s an iron bar. Just hold the ingot in your hand and press on the character for a long time. And then click on the Time button. Note that the new characters on the Android tablet have become much stronger than ordinary villagers. So now they will be able to defeat even more enemies with one blow. Their health now has 1000 hearts, and the damage is 500 units. With this addition, you get three bosses, with which your friends will help you. But there must be a lot of them. Saens replaces the Skeleton in the game. He has two hearts of health. Shoots arrows and does not burn in the sun. Azrielm will replace the Wanderer of the Edge. Has 49999.5 hearts, and damage – 9999 units. Papyrus replaced Streya. Has 250 heart health. He is not afraid of the sun and shoots arrows. 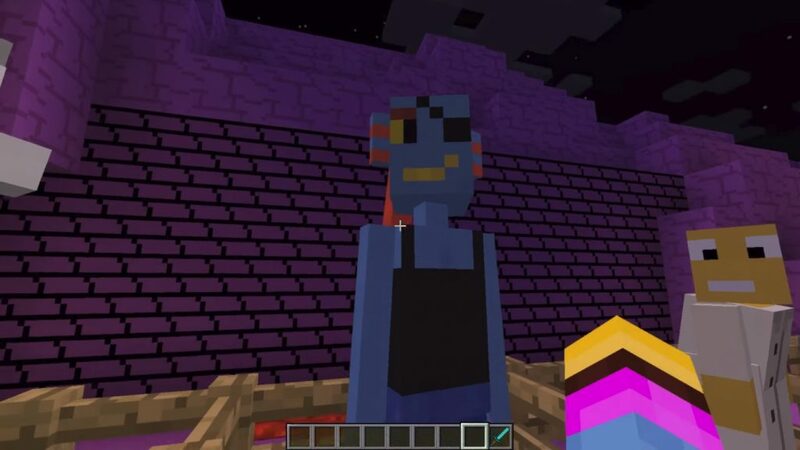 As you can see, the UnderTale Friends mod on Mayncraft 1.0.4, 1.0.3, 1.0.0 received for free will bring you a lot of interesting. As long as you make friends with all, until you defeat the enemies, you will not notice how much time will pass.